Who can resist a chocolate muffin? 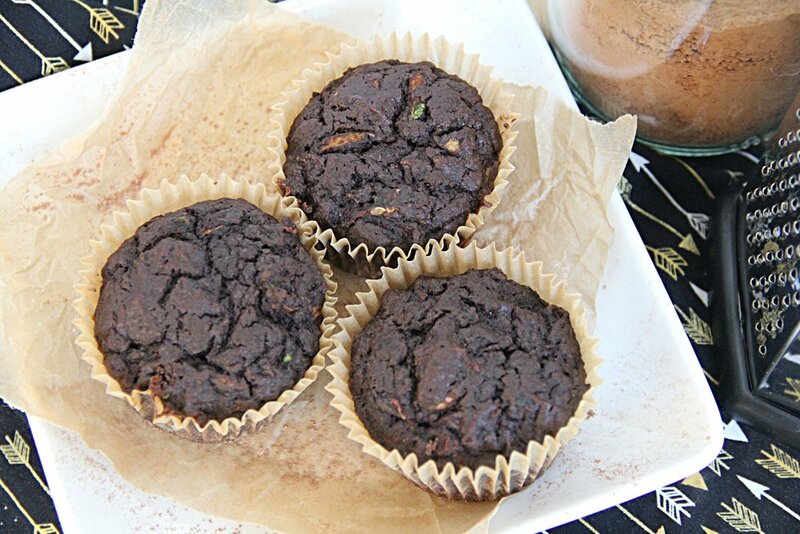 And when it's got a little zucchini in it, you can feel great about eating a vegetable for breakfast...plus these muffins are low in sugar & nut free! When my daughter was little she went to a kids cooking class where they made a chocolate zucchini bread & she fell in love with it, so now she loves that these muffins are healthy & she likes to grate the zucchini! Which is perfect for me because I get help in the kitchen & get time with my girl! Of course these are great for breakfast but think of all the other ways you could eat them...as a snack on a hike, a treat in a lunchbox or an extra goodie for a picnic basket. The possibilities are endless! And if you need ideas for other healthy snacks, check out these spiced pecans or these almond joy cookies. preheat the oven to 350º and line a muffin pan with paper baking cups. grate the zucchini & wrap in a clean kitchen towel or paper towels, squeeze to get out extra moisture. in a medium size bowl combine dry ingredients. in a small bowl whisk together eggs, apple sauce, avocado oil, stevia & vanilla. whisk wet ingredients into the dry mixture until batter is smooth & then fold in zucchini until evenly distributed. evenly distribute batter into muffin cups. bake 15-18 minutes, until a toothpick inserted into the middle of the muffin comes out clean. allow to cool about 5 minutes in the pan, then transfer the muffins to a cooling rack.